As the mom of many, my life is incredibly busy. I love making homemade meals for my family every night of the week, but sometimes I need something that might be a little easier. Since having side dishes at every meal is important to me, to get my kids to eat veggies as often as possible, I often make sure I have at least two at every meal. This is because I do have a few picky eaters. New Idahoan Signature Russets are the perfect solution. 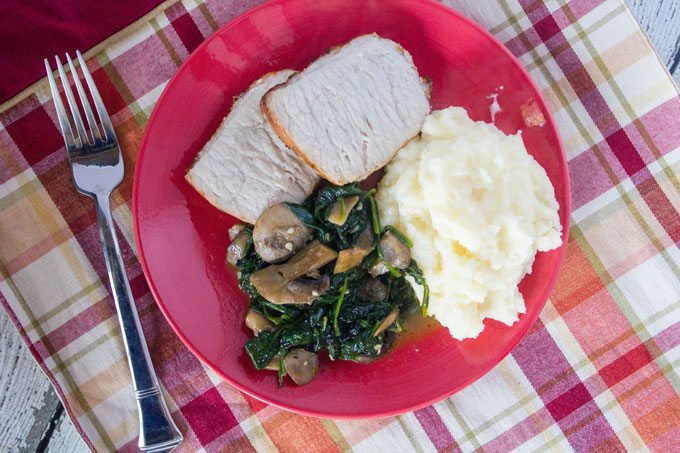 Pair them with Garlic Butter Spinach and Mushrooms and you’ve got side dishes fit for a dinner party! 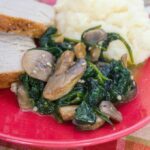 I paired them for dinner with these ridiculously easy Garlic Butter Spinach and Mushrooms. The combination was perfect for our dinner and most of us had both! But it also offered my kids a delicious creamy mashed potato dish that no kid can turn their nose up at! I am one of the lucky mom’s though that can get her kids to eat spinach if I make it the way they like it. I have two that love Brussels Sprouts as well! But honestly, every kid in my whole house loves mashed potatoes. And with New Idahoan Signature Russets mashed potatoes all you need is some water, butter and milk and a whole five minutes and you have fluffy mashed potatoes that taste creamy and perfect and rival my homemade version! Melt 2 tablespoons of butter in a skillet over medium low. 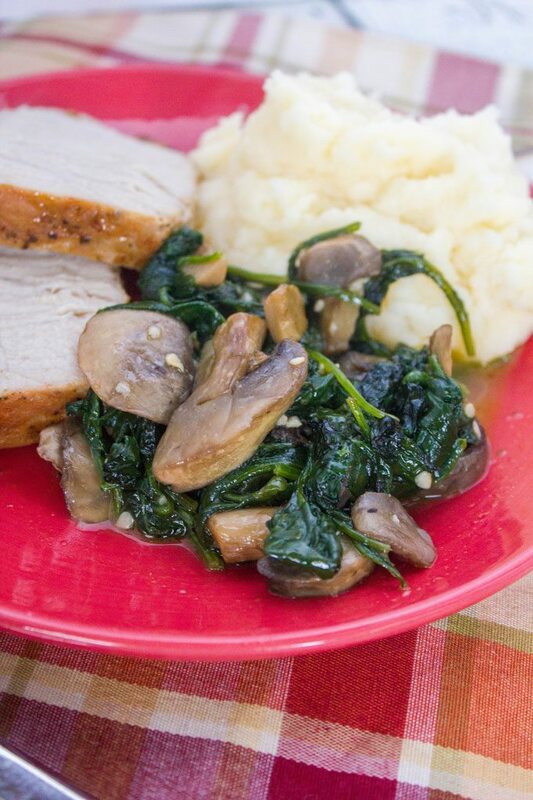 Toss in the chopped mushrooms and cook for about 5 minutes or until mushrooms are slightly browned. Add the minced garlic and the remaining tablespoon of butter. Add in the baby spinach immediately. The spinach will at first look like it won't fit in the pan, but after a few minutes it will shrink down tremendously. Stir everything several times. Add some salt and pepper if desired. Cook another 3-5 minutes, stirring frequently. 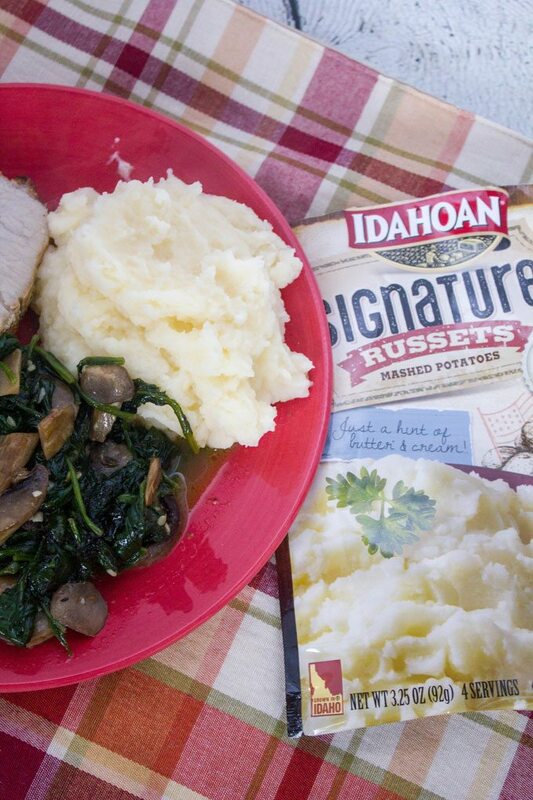 Idahoan Signature Russets Mashed Potatoes are available at nationwide including Walmart and Kroger! Pick them up today for tonight’s meal! I’ve partnered with Idahoan on this sponsored post and all opinions stated are my own.